In the previous article ( http://ponnadi.blogspot.in/2012/10/archavathara-anubhavam-parathvadhi.html) we observed the parthvAdhi panchakam in detail. Let us now start seeing how AzhwArs enjoyed the archAvathAra emperumAns. To start with, we should understand that all of aruLicheyal is specifically there for archAvathAra anubhavam. This is clearly explained by azhagiya maNavALa perumAL nAyanAr in AchArya hrudhayam chUrNikai 70. Here in this chUrNikai nAyanAr makes a table of pramANam and pramEyam based on the vEdha vEdhyan nyAyam (this principle explains that vEdham took the avathAram of srI rAmAyaNam to explain emperumAn who took the avathAram of srI rAman). srI pAncharAthram speaks about vyUha emperumAns. manu smrithi, etc speak about antharyAmi emperumAn. srI rAmAyaNam and mahAbhAratham speak about vibhavAvathArams like sri rAman and krishnan. aruLicheyal (also known as dhrAvida vEdham or thamizh vEdham) speaks about archAvathAra emperumAns. 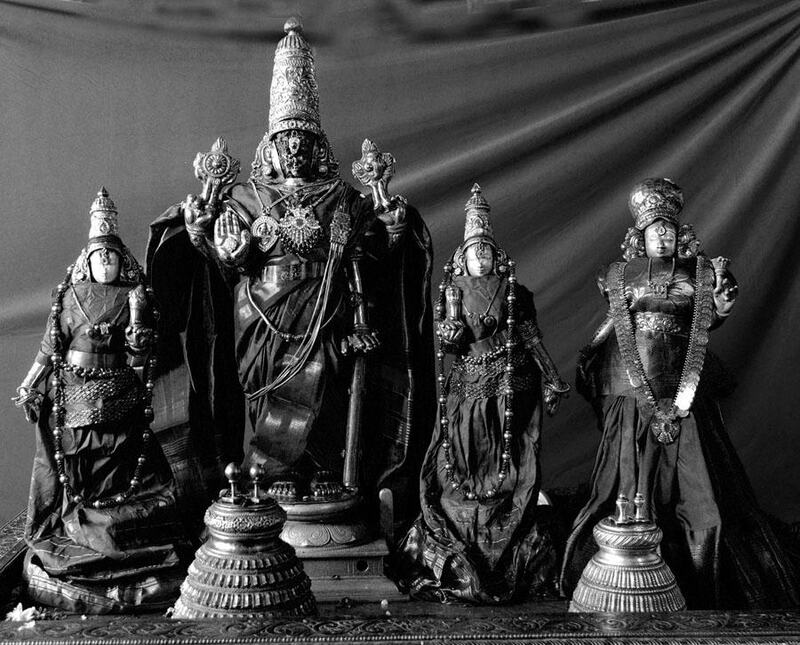 emperumAn hand picked a few jIvAthmAs from leelA vibhUthi, showed them his divine beauty and qualities, gave them blemishless knowledge through which they can see past, present and future and made them AzhwArs. AzhwAr literally means one who is immersed in bhagavath vishayam. sukAchAryar, etc and mudhalAzhwArgaL (poigaiyAr, bhUthathAr, pEyAr) are immersed in parathvam. 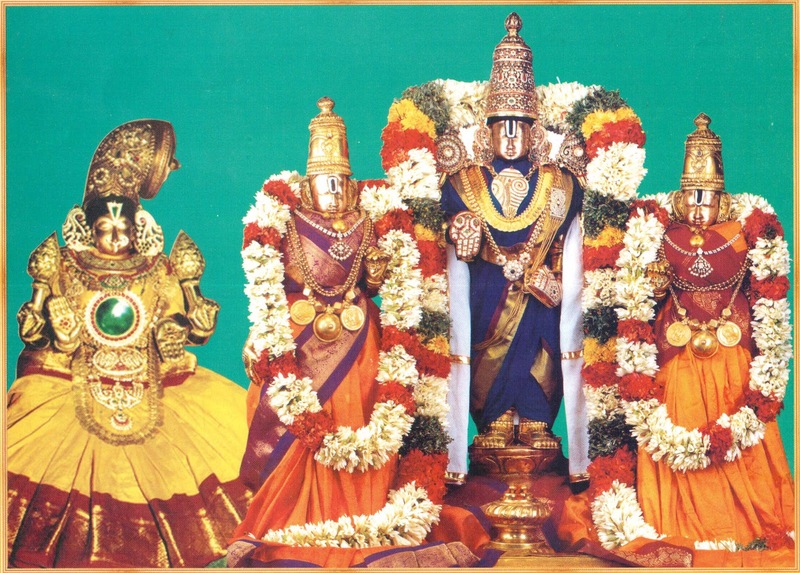 sanakAthigaL (sanaka, sanAthana, sanandhana, sanathkumAra) and thirumazhisai pirAn are immersed in antharyAmithvam. 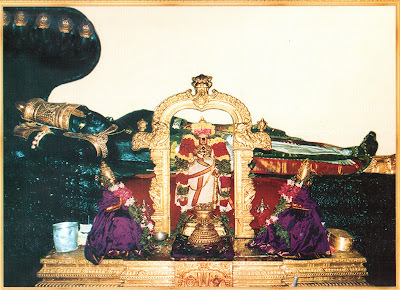 vAlmIki, kulasEkara AzhwAr, etc are immersed in rAmAvathAram. parAsara rishi, vEdha vyAsa rishi, nammAzhwAr, periyAzhwAr and ANdAL are immersed in krishnAvathAram. 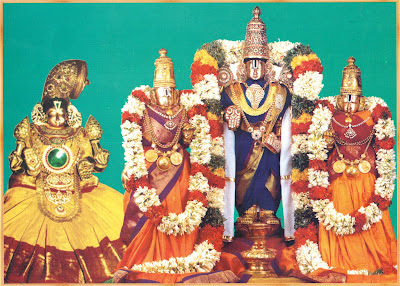 nAradhar, thoNdaradi podi AzhwAr and thiruppANAzhwAr are immersed in srIranganAthan. saunakar and thirumangai AzhwAr are immersed in all archAvathArams. Even though each AzhwAr has different focus, they are unanimously enjoying archAvathAram through their mangaLAsAsanams in their pAsurams. Let us start with mudhalAzhwArgaL and observe how they enjoyed archAvathAra emperumAns. In poigai AzhwAr's vAzhi thirunAmam, he is glorified as "vEnGkatavar thirumalaiyai virumbumavan vAzhiyE" (வேங்கடவர் திருமலையை விரும்புமவன் வாழியே). He has glorified thiruvEnkatamudaiyAn and his vAsasthalam thirumalai in many pAsurams. He shows that the dhivyadhEsam where emperumAn lives is as enjoyable as emperumAn himself (if not more). Let us see a few of his anubhvam here. emperumAn takes the form that pleases his bhakthas. He keeps the names which are liked by his bhakthas. In however form/name his bhakthas meditate on him, he becomes/accepts such form/name. In nampiLLai's vyAkyAnam, he brings out some great meanings and beautiful idhihyams. nampiLLai relates this to gIthA slOkam "yE yathA mAm prapadhyanthE thAms thathaiva bhajAmyaham" where kaNNan emperumAn says "however one surrenders to him or approaches him, he reciprocates them in their way they want him to be". nampiLLai also explains that emperumAn will take any form based on his bhakthas ruchi. nampiLLai also shows a few idhihyams in this pAsura vyAkyAnam. Some small children were playing on the banks of river cauvery. They drew a small picture of emperumAn in the sand and they were enacting the thiruvArAdhanam of namperumAL. At that time emperumAnAr passes by that area and the children show him that picture on the sand is none else than his emperumAn. Hearing this, emperumAnAr immediately falls flat on the ground and performs a full praNAmam. emperumAnAr was able to truly appreciate the children's devotion and had full faith in AzhwAr's pAsuram which explained that emperumAn will have his presence when a bhaktha desires so. One srivaishnava named his emperumAn "sathangai azhagiyAr" (one who has beautiful ankle bracelets). One day, emperumAn wanted to show his attachment for that name to that swamy. He appeared in his dream and danced nicely. When he asks who he is, emperumAn says "I am sathangai azhagiyAr" and this swamy is very pleased with that. nanjIyar's thiruvArAdhana emperumAn is named "Ayar thEvu". He once appears in engaLAzhwAn's dream and asks for nAval pazham. engaLAzhwAn asks who he is and he says "I am jIyar's son Ayar dhEvu" - emperumAn had such attachment towards nanjIyar and he happily reveals himself as related to nanjIyar. In pAsuram 26, AzhwAr identifies how thiruvEnkatamudaiyAn is approached by 3 types of adhikAris - ishvaryArthi (one who is behind material wealth), kaivalyArthi (one who is behind AthmAnubhavam) and bhagavath charAnArthi (one who wants to surrender to emperumAn and serve him eternally). In this pAsuram he also shows how the thirumalai (hill) itself destroys the sins of the ones who approaches him and how it enhances the bhagavath anubhavam of nithyasUris. In pAsuram 38, AzhwAr describes the beauty of thiruvEnkatam and also explains the greatness of the AdhivAsis who live there. He glorifies the AdhivAsis who live there as "oN kuravar". The greatness for these kuravars is that, when some one from their ancestory had left thirumalai hill, it will be considered as a blot in their reputation for many generations to follow. So, they were very careful not to climb down the hill (thirumalai) for whatever reason. They had such attachment towards the dhivya dhEsam and the emperumAn there. In many other pAsurams, AzhwAr shows his attachment towards thiruvEnkatamudayAn and his abode thirumalai. In bhUthathAzhwAr's vAzhi thirunAmam, he is glorified as "ponpuraiyum thiruvaranGkar pugazhuraippOn vAzhiyE" (பொன்புரையும் திருவரங்கர் புகழுரைப்போன் வாழியே). He reveals the glories of sriranganAthan in great detail in his pAsurams. In pAsuram 28, when explaining the different manifestations of emperumAn, he explains sriranganAthan as "Ninaippariya NILaranGgaththuLLAn" (நினைப்பரிய நீளரங்கத்துள்ளான்). nampiLLai in his vyAkyAnam explains that, thiruvaranganAthan is not like other types of manifestations (param, vyUham, etc) and also not like other archAvathArams. Because, he is most enjoyable in periya kOil and is planted there until all the samsAris are given salvation (i.e., that means he is here forever). Let us enjoy a beautiful pAsuram of AzhwAr on thiruvaranganAthan. This is a very important pAsuram as shown by nampiLLai in his vyAkyAnam. Except for the ones who completely depend upon thiruvaraganAthan for salvation, the gates of srivaikuntam will not open. For the ones who completely surrender to emperumAn, this will be a very easy task to accomplish. nampiLLai explains a few great principles in the vyAkyAnam in a detailed manner. First, emperumAn's soulabhyam in archAvathAram is established here. kaNNan emperumAn said "mAm Ekam sharaNam vraja" and our pUrvAchAryas have explained that "mAm" represents emperumAn's soulabhyam as emperumAn put himself down to a lowly position of chariot driver for arjunan. But here in archAvathAram that soulabhyam of kaNNan emperumAn looks like parathvam, since emperumAn is taken a deity form and makes himself completely dependent on his bhakthas. This is shown as his most adorable quality in archAvathAram. He also explains that para, vyUha, vibhavam have certain limitations based on place, time, etc., which means only certain people at certain times can see emperumAn. But here in archAvathAram, every one can see emperumAn any time. It is also explained that this samsAram is very difficult to over come with the limited abilities of the jIvAthmA. It is an endless cycle of avidhyA, karmA and janmA where the jIvAthmAs are suffering. By depending on emperumAn one can cross this ocean of sufferings since emperumAn can easily relieve the jIvAthmAs of their miseries. Finally the difference between svagatha svIkAram and paragatha svIkAram is explained by nampiLLai. He identifies that one who gets emperumAn by emperumAn's grace only is the most successful and the others are set to fail. He starts with thiru - "thirukkanNdEn" (திருக்கண்டேன்) and ends with thiru - "pU mEl thiru" (பூ மேல் திரு). so, he establishes emperumAn is sriya:pathi clearly both in the beginning and end of the prabhandham. Also in the second pAsuram he mentions about thiruvadi - "inRE kazhal kanNdEn" (இன்றே கழல் கண்டேன்) and how the thiruvadis relieve us from all miseries. In the last pAsuram he says "thAL muthalE NanGgatku chArvu" (தாள் முதலே நங்கட்கு சார்வு). Thus he shows complete dependency on emperumAn's thiruvadi. Since AzhwAr has so much attachment for empeumAn's thiruvadi, he rightfully performed his mangaLAsAsanam in thiruvallikkENi dhivyadhEsam where emperumAn is present as pArthasArathy. pArthasArathy emperumAn as githAchAryan declared in so many slOkams that surrendering to him is the only upAyam to easily relieve oneself from samsAram. Let us enjoy AzhwAr's mangaLAsAsanam for thiruvallikkENi emperumAn. In mUnRAm thiruvanthAdhi, pAsuram 16 AzhwAr enjoys emperumAn as sriya:pathi. 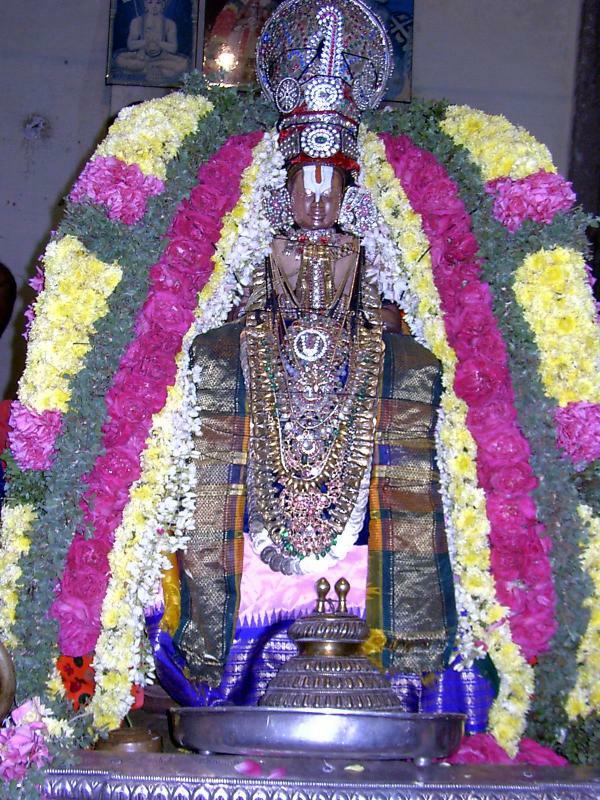 srI mahAlakshmi who lives in a most beautiful lotus flower climbed emperumAn's beautiful chest (thirumArbu). That empermAn who is my swAmy resides in thiruvallikkENi where we see beautiful waves in the seashore which pushes out beautiful red pearls (pavaLam) and white beads (muthu) and the place is decorated with beautiful lamps. In the vyAkyAnam, nampiLLai shows the beautiful charithram of srI mahAlakshmi coming out of kshIrAbdhi and climbing the chest of emperumAn and staying there permanently. It is to be understood that pirAtti anyway lives in emperumAn's chest all the time but this is a specific leelai of emperumAn to show that pirAtti and emperumAn are naturally attracted towards each other. nampiLLai says that emperumAn is purushOththaman and pirAtti is nArINAmuththamai (making this mithunam a great combination). He also explains that when kshIrAbdhi is churned, pirAtti comes out of it and while everyone is watching she goes and garlands emperumAn. Just like a wife will go to her husband without any shyness in front of the children, pirAtti (jagan mAthA) also approached emperumAn (jagat pithA) in front of all the dhEvas (children of emperumAn). nampiLLai also shows three different bhakthas of emperumAn who got the grace of pirAtti and emperumAn. thiruvadi (hanuman) got the grace of emperumAn first and then he got blessed by pirAtti after. vibhIshaNan gets the grace of pirAtti first and then got blessed by emperumAn. guha perumAL got blessed by both pirAtti and perumAL at the same time. And all these anubhavam, emperumAn was showing him through is archA thirumEni to pEyAzhwAr. pEyAzhwAr also performed mangaLAsAsanam to many other archAvathAra emperumAns in his prabhandham. 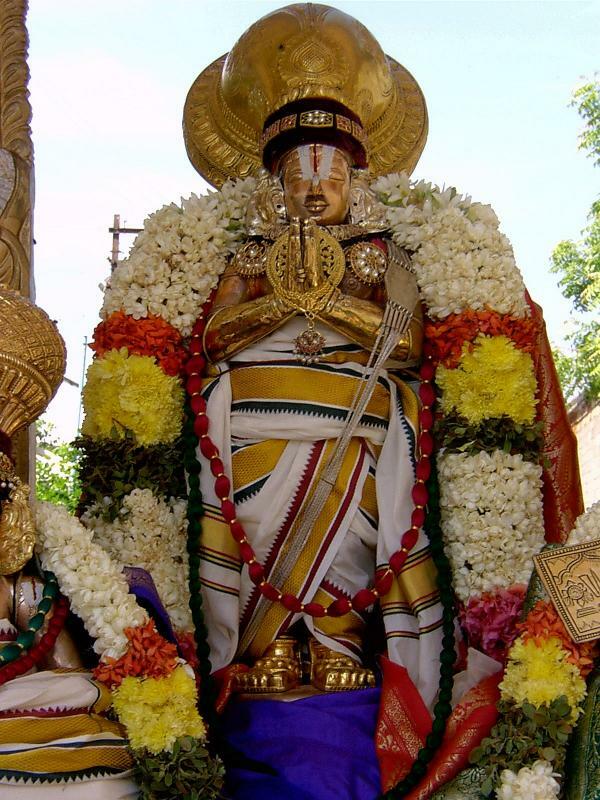 In pAsuram 62, he glorifies thiruviNNagar, thiruvekkA, thirumalai, thiruvELukkai, thirukkudanthai, thiruvarangam and thirukkOttiyUr. pAsuram 63 is also very important which is often misunderstood to be equating mahAvishNu and paramashivan. In this pAsuram pEyAzhwAr explains that both emperumAn and sankaran are seen in the archA thirumEni of thiruvEnkadamudaiyAn. In the vyAkyAnam, nampiLLai explains that one is sAdhaka vEsham (a devotee who has matted hair, etc) and other is decorated/woshippable vEsham (crown, etc) and its a great wonder (Ascharya shakthi) that emperumAn is showing both the forms together. nampiLLai also explains that emperumAn is manifesting his great quality of souseelyam here - mahatha: mandhaischa nIrandhrEna samslEsha svabhAvam souseelyam - a great person mixing with a lowly person without showing any difference is called souseelyam (magnanimity). In the next article we will continue with the other AzhwArs. Very beautiful. It is so nice to ready about the mudhal azhwars on their thirunakshathirams.